COMMISSIONED IN 1922 to celebrate a century of Brazilian independence, our origins are certainly grand. Yet back then few could have foreseen the unique position the hotel would come to adopt among Rio’s high society. Our famed Golden Book overflows with the names of famous faces who’ve visited, from Brigitte Bardot to Justin Bieber; Walt Disney to Diana, Princess of Wales. No matter who you are – when you stay at The Copa, you’re sure to feel like royalty. Retreating from Rio’s bustling streets, you are welcomed into an oasis of calm. Timeless luxury is on show throughout. Rooms feature freijo wood or mahogany furnishings, while bathrooms are finished with pink and white Brazilian marble. Set apart on the sixth floor, the seven penthouse suites are adorned with antiques. They share a private swimming pool with spectacular views over the Copacabana neighbourhood. Each room is soundproofed and feature beds so comfortable that Keith Richards’ wife wanted to take one home. No matter how wild the party outside, you’re sure to get a good night’s sleep. Each year when carnival comes to town, our legendary Copa Ball brings the festivities indoors. Rio’s most glamorous names dance the night away under the glimmering chandeliers of Salon Nobre. The adjacent Golden Room is equally opulent, having witnessed performances by Nat King Cole and Ella Fitzgerald. It was even immortalised in film, with Ginger Rogers and Fred Astaire’s 1933 hit Flying Down to Rio.It ensured our name was known the world over. Our restaurants have become destination venues in their own right, too. 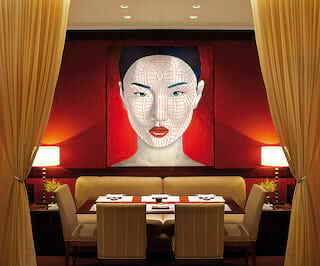 Michelin-starred MEE boasts a mouthwatering Pan-Asian menu, and is home to 25 imported varieties of sake to try. The equally revered Hotel Cipriani Restaurant offers elegant Italian-inspired plates in a resplendent dining room. You can also enjoy casual, poolside dining on the terrace of Pérgula Restaurant. Guests can stay in shape on the hotel’s tennis court or in our state of the art fitness centre. With the Copacabana beach footsteps away, you’ll never be short of activities. Join a game of volleyball, dip in the sea or stroll down the shore towards the distant Sugarloaf Mountain. 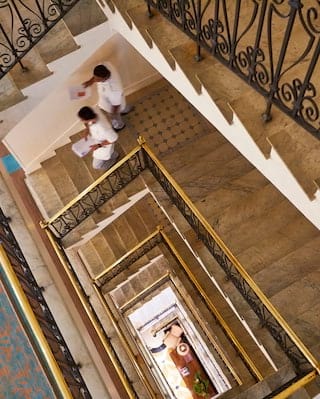 Belmond Copacabana Palace is a hotel like no other. Come and enjoy the best Rio has to offer.